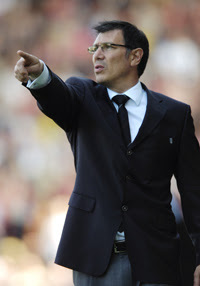 It seems Lawrie Sanchez has been taking sartorial tips from my good self. This picture was taken at the recent Asia Cup competition and shows (if you look really closely and squint) that Mr S has bought himself a new pair of specs. My Spurs mate JB reckons they are exactly the same as mine. Have a look at my profile picture (down there on the right) and see what you think. They are pretty close. If he has I can only recommend him for his fantastic taste. My pair are without a doubt the best pair of glasses I have ever owned and, I think, succeed in making me look more sophisticated and intelligent than I actually am! Maybe Lawrie's been reading the Chronicle and felt the same way.